The Mount Fuji and Mount Fuji lakes area have a lot to offer in terms of sightseeing. The Kawaguchiko Music Forest is a small theme park and museum that is devoted to automatic musical instruments. 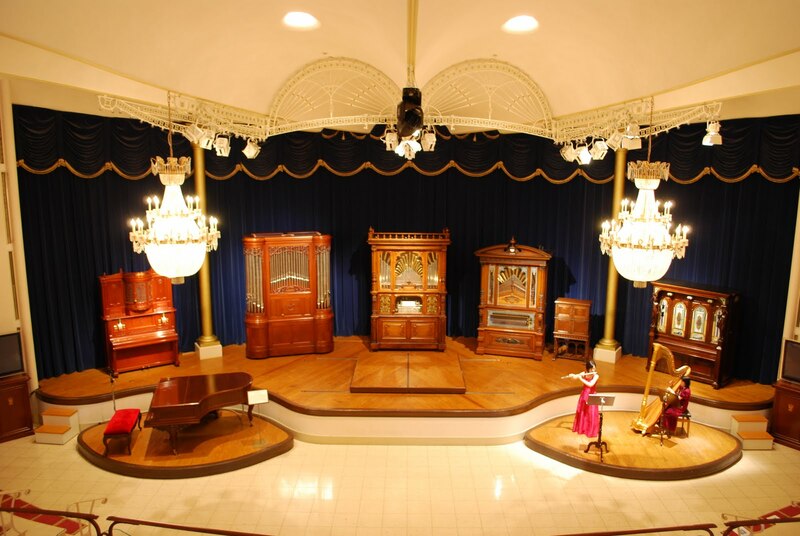 In the History Hall, not only there are various musical automatons but there is also a large hall in which you can listen to the beautiful orchestrations of an orchestra automaton and the automatic violin and piano. One of the most valuable orchestrions in the hall is the philharmonic orchestrion -Titanic model. This orchestrion was supposed to be installed in the Titanic (yes THE Titanic) but was cancelled right before the installation and thus saved from sinking to the bottom of the sea along with the ship itself. This orchestrion still sounds amazing and I really recommend going to see it because not a lot of people know about this orchestrion and how it is sitting near in Mount Fuji. With a beautiful view of Mount Fuji, Carillon Square is the stage of an extraordinary fountain show. The Organ Hall is an underground hall and the entire hall is one enormous dance organ. Made around 1920 in Belgium, this dance organ has approximately 800 pipes and an assortment of percussion instruments. There are also 43 dolls holding fully functional instruments strewn around the hall. This dance organ alone is capable of making music equal to that of an orchestra with 30 to 40 people. These dance organs were originally placed in dance halls, hence the name dance organ. There are also a few stores within the park where you can buy original souvenirs and a place where you can make your own music box. If you are taking a trip to the Mount Fuji area, I highly recommend visiting this Music Forest! The performances of the orchestrions and the numerous music boxes at this park are wonderful and truly can only be seen here in Japan. Fuji Shibazakura Festival, the best place to see Mt Fuji in spring! Suspended between the Sky and Mt. Fuji!